While boarding by remote stand commenced at 12:10AM, we only made it to the plane at 12:30AM. 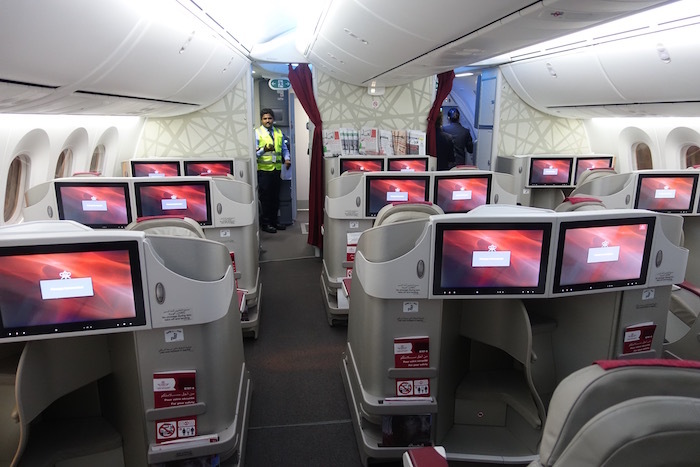 We boarded through door L2, where we were greeted by the cabin manager and pointed left towards business class. 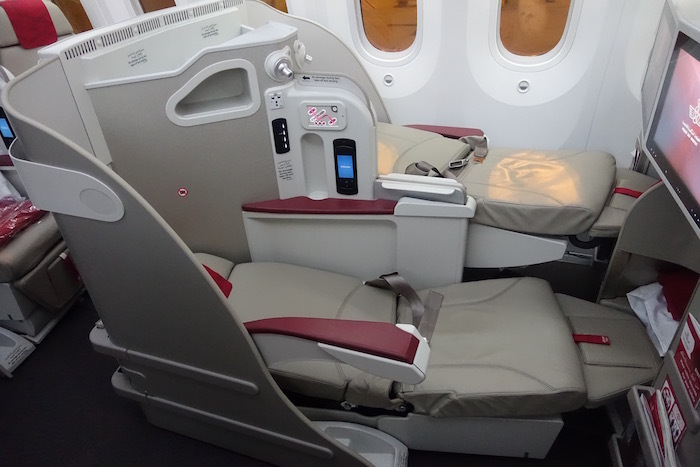 Royal Air Maroc’s 787 business class cabin is located between doors one and two, and features a total of 18 seats spread across three rows, in a 2-2-2 configuration. Most airlines have seats that are a slight variation of one another, though this was a completely new one for me. 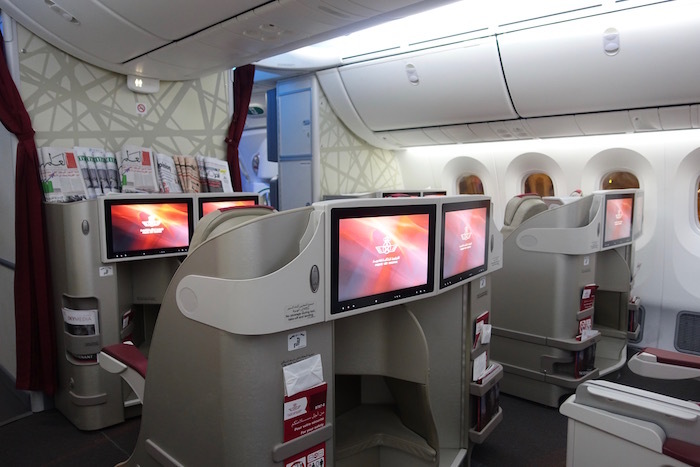 These seats are only available on select planes of Royal Air Maroc, Philippine Airlines, and Air Europa. As I entered the cabin, the first thing that stood out to me was the variable height of the ottomans at each pair of seats. The cabin itself looked fairly nice. While the tones were neutral, the bulkhead design added a bit of pizzaz to the cabin. We quickly found our seats, 2A & 2C, which were angled towards one another. The legroom at each seat was plentiful, though I was surprised by how thin the seats themselves were — they really weren’t very well padded. Again, the surprising part were the ottomans, and their variable heights. As you can see, the window ottoman was way higher than the aisle ottoman, to the point that there’s no way you could comfortably put your feet up when in the window seat if you’re in the upright position. The cabin also wasn’t especially private, in the sense that there weren’t many partitions between seats. All of the controls were to the left of my seat, including the entertainment controls, seat controls, power port, and USB port. Behind that was a reading light and a small storage compartment, big enough for headphones. The issue was that when the seat was in the upright position it blocked one from placing something in there. The seat controls were easy to use, even if the seat itself was bizarre (more on that later). I was happy to see that there were individual air vents at every seat, which isn’t always the case on non-US airlines. The one major disappointment about the product was that they didn’t have proper blankets. While the pillow was fine, the blanket was similar to what you’d find in economy. I was very pleasantly surprised when one of the business class flight attendants introduced herself, as she was really warm and friendly. She offered us pre-departure beverages, with a choice between apple juice, orange juice, tomato juice, or water. I chose a glass of apple juice, and loved the Royal Air Maroc branded glasses. She then distributed amenity kits, which were fairly nice, with the basics, including a comb, toothbrush, toothpaste, earplugs, eyeshades, and socks. On top of that there were a few Aigner amenities, including hand cream, lip balm, and a refreshing mist. She then distributed headphones, which were decent quality. Over the next 20 (or so) minutes, another couple of buses pulled up to the plane with more passengers. 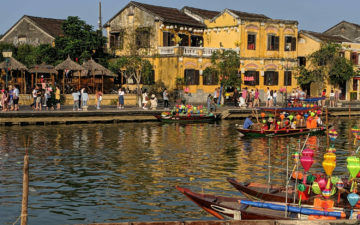 Initially there were only supposed to be seven passengers in business class, though during boarding the station manager upgraded four people to business class. There were hugs and kisses, etc. While people complain about the “free” upgrade system in the US, “friends and family” upgrades seem to happen all the time on just about every “national” airline. At 1:30AM the door was closed, at which point the cabin manager made her welcome aboard announcement, informing us of our flight time of 7hr10min. Moments later the safety video screened. Our taxi to the runway was pretty quick, and at around 1:45AM the captain made a welcome aboard announcement, though it was inaudible. Moments later we were airborne on runway 34L. The views on departure were fantastic, including of the Doha skyline. As much as I don’t love Doha as a city, the skyline is one of the nicer ones in the region from above. As we climbed out I browsed the inflight entertainment, starting with the airshow. Royal Air Maroc uses the same airshow system as so many other airlines, with constantly changing perspectives on where you are. The selection of on demand movies and TV shows was okay at best. There were ~25 movies, though the selection of TV shows was underwhelming, as there were only a few to choose from. However, I do appreciate that they didn’t have ads before any of the programming. I decided to watch Barbershop, which was pretty entertaining. I wasn’t sure what to expect from the service on this flight, given that it was a seven hour redeye departing at around 2AM and landing at around 7AM. I was expecting there would be a light snack after takeoff and then breakfast before landing. Boy, was I wrong. There was a very extensive dinner service after takeoff. The service was pretty slow to get started — about 40 minutes after takeoff drinks and canapés were served. The canapés were delicious, and I had a gin & tonic and sparkling water to drink. After that hot towels were distributed. Then 25 minutes later tablecloths were set, and then a tray was brought out with the appetizer and salad. The appetizer (which was also a salad) had cherry tomatoes, prawns, and parmesan cheese. Meanwhile the side salad had cherry tomatoes, iceberg lettuce, feta cheese, chicken, and shaved carrots. I found it a bit odd that they essentially served two salads, but I didn’t care much, since they were both tasty. About 20 minutes after that a cart was rolled around with all the main courses. I apologize for the lack of descriptions, as there were no menus on this flight. However, the choices were between beef, salmon, and a mixed grill. I loved that they rolled out a trolley with the entire selection, as it’s great to be able to see the dishes before you order them. I also loved the decorative flowers on the trolley. I chose the beef, which was excellent, including the sauce and veggies. Matthew chose the salmon, which looked excellent as well. About 25 minutes later an impressive cheese cart was rolled around. 15 minutes after that, a cart was rolled around with fresh fruit and cheesecake. I had the cheesecake, which was excellent as well. The meal service was really drawn out, and lasted about 2hr15min. I can’t say enough good things about the flight attendant working the aisle. She was an absolute delight, and so charming. Meanwhile the more senior cabin director seemed to be working the galley. Furthermore, I thought the food quality was excellent overall. I will say that I think the meal service may have been a bit of an overkill for a seven hour flight departing at around 2AM. The fact that the service took 2hr15min limits the amount of time one can sleep. After dinner I checked out the lavatory, located at the front of the cabin. The lavatory was on the small side, though had the typical 787 design. After that it was time to get some sleep, which is when we discovered just how bizarre these seats are. When reclined, the seats in this configuration literally recline to different levels. It’s so, so strange. I wrote a whole separate post about how strange I find these seats to be. 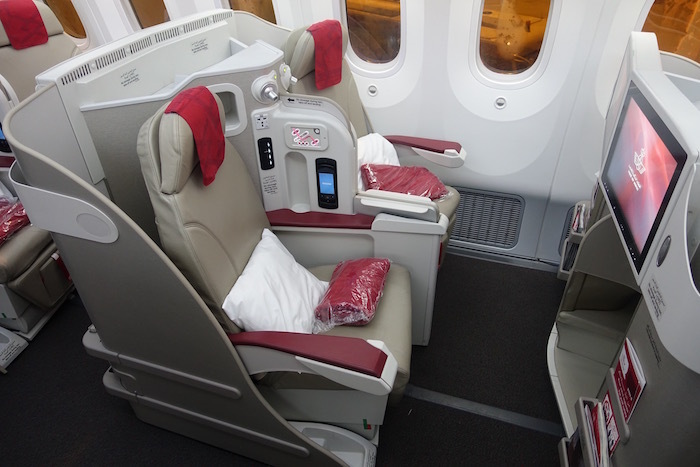 Ultimately they’re a huge improvement over the old recliner seats that Royal Air Maroc had on their 767s, though as far as new fully flat seats go, these are just plain strange. For whatever reason I couldn’t sleep very well. It was probably a combination of jetlag, the strange configuration, and the lack of a proper blanket. I managed to sleep for a little while, though woke up about three hours out. I worked for about 90 minutes, and when the flight attendant saw me awake she came up to me and said “you fell asleep before you could take a picture of the liqueur cart.” I thought that was cute, given that I had taken a picture of all the other carts they used for the service. Unlike dinner, all of breakfast was served on one tray, fortunately. Breakfast consisted of scrambled eggs with a hash brown and a cherry tomato. There was also a delicious plate with fresh fruit. Then there was also a plate of carbs, including a roll, a chocolate pastry, and a croissant. Lastly, there was some plain, full cream yogurt. Breakfast service was done a bit over an hour before landing, so I spent the rest of the flight working on my laptop while watching the airshow, as we flew along the northern coast of Africa. About 30 minutes before landing immigration cards for Morocco were distributed. Roughly 30 minutes before landing the captain made another announcement, informing us of our landing time of 6:55AM. Moments later we began our descent. Sure enough we touched down a few minutes before 7AM, and about five minutes later made it to our arrival gate at the terminal. 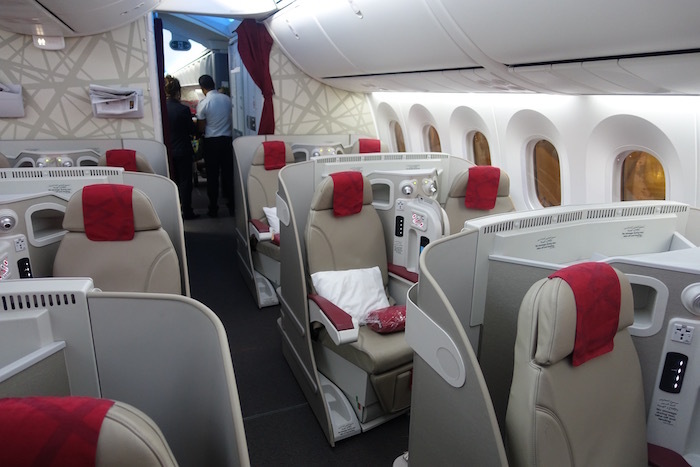 I was extremely impressed by the service in Royal Air Maroc business class. The flight attendant taking care of us was friendly and charming. I was also impressed by the quality of the meal service, as well as how extensive it was. In the end I’m not sure if that was actually a good or bad thing, since food was being served for about half the redeye, but the effort was appreciated. 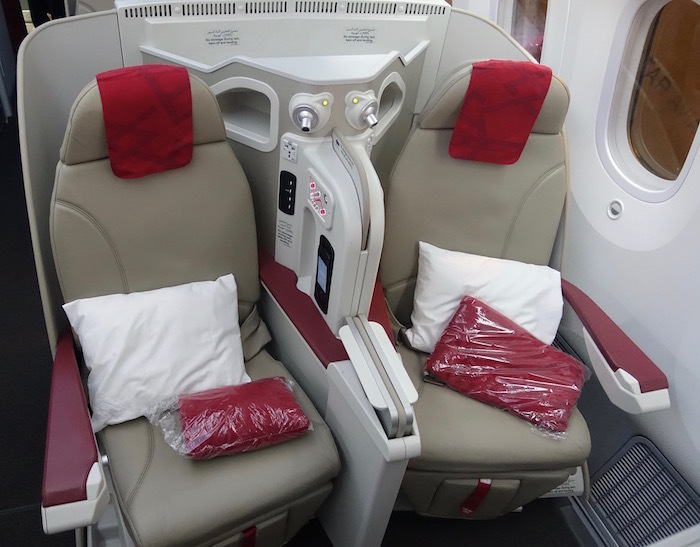 While the new fully flat Royal Air Maroc seats are a huge improvement over their old product, this has to be one of the worst new business class seats out there, in my opinion. I suspect they got a great deal on it, which would make sense given the other airlines that have bought it so far. My biggest complaint about the product, however, was the lack of a proper blanket. 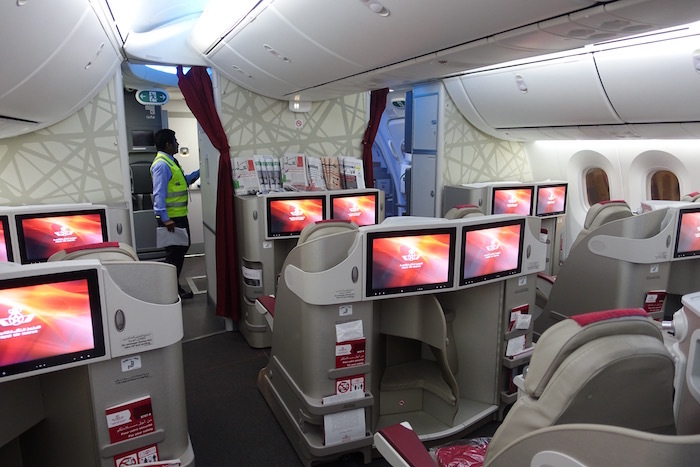 Overall I was very impressed by Royal Air Maroc — they exceeded my expectations. Have flown them a few times in West Africa. Had IRROPS in Liberia and they were pretty good taking care of us. Very strange seat! If I in the top bed, you may accidentally drop your legs over the side and nudge the guy on the bottom bunk! 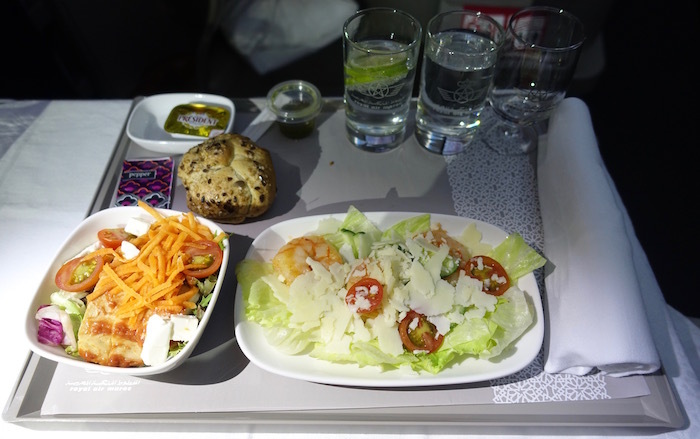 It’s a shame because for me, the seat is the most important thing when buying a business class ticket – Service and quality of food and drink come second and third. But like you said judging by the carriers who have bought it, it was probably a very good deal. 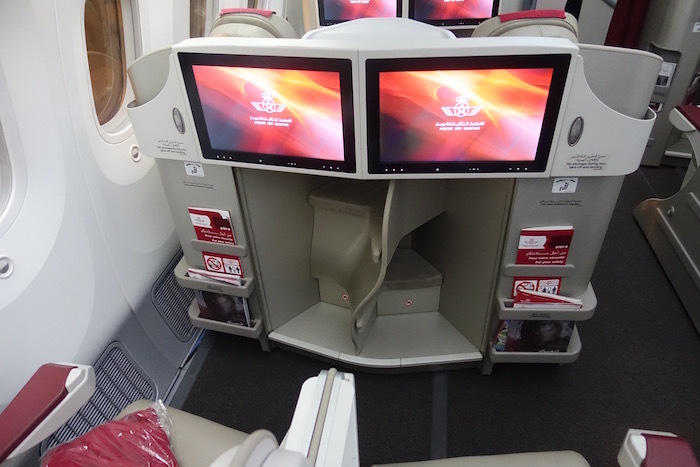 I flew with them once from CMN to AMS and on boarding received an upgrade to Business class. It was a delightful flight – excellent service and surprisingly good food for the 4 hour flight to Amsterdam. 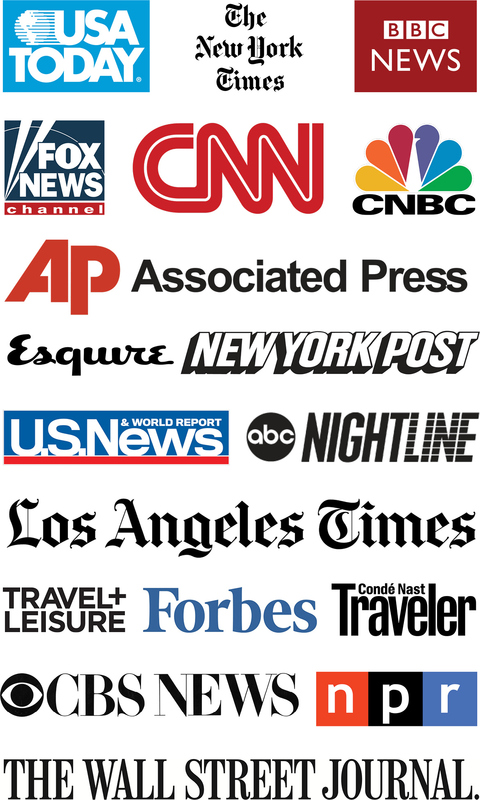 I was thoroughly satisfied with my experience on them. Lucky: Other than the seats I was really impressed with the airline. So, back to the seats, I would imagine airlines have choices when they order their planes like we do when we order our cars. Thus, Air Marroc may have made a bad choice when choosing the seats but wouldn’t be Boeing the one to blame here for offering such bad seats? I know this may be a budget choice by Air Maroc but just wondering if you have insights on how these options are chosen and in this specific case if Air Maroc got bad seats on purpose just to save money or if Boeing had a bad selection to offer them? You mentioned how bad the configuration was but also the poor padding. You also said these seats are only available at Royal Air Maroc, Philippine Airlines, and Air Europa which I don’t consider premium airlines. Are these the cheapest seats available when you order at 787? @Santastico: Boeing does not actually recommend or supply the seats – they ensure that the products provided by the multiple seat manufacturers can be integrated into the airline with some limiting specifications. The airline can pick and choose from the available selections. Ultimately, the seat and other custom product manufacturers send them to Boeing for assembly in Everett or in North Carolina. This one seems like a customized Cirrus offering. 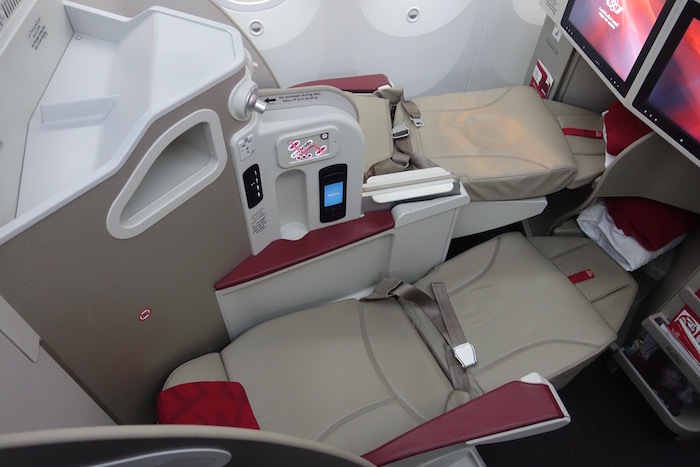 JAL’s new B777-200 has similar type in the middle 2 seats of 1-2-1 configuration. It’ll be interesting to compare the difference. 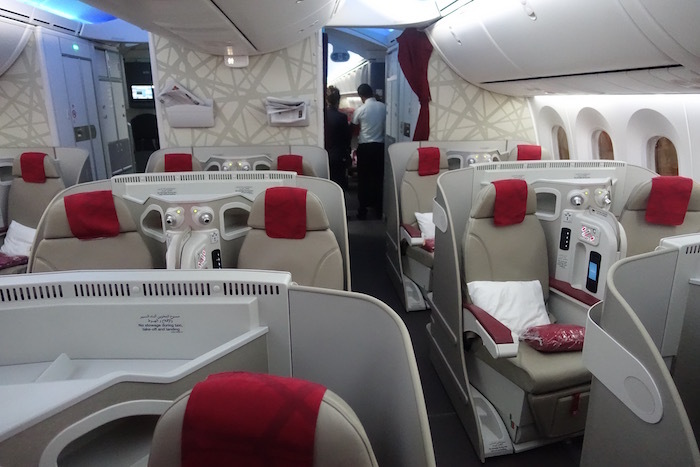 Thanks for sharing the experience; there are few reports on Royal Air Maroc’s new B787 and it’s always fun to read reviews of an unexplored airline, which makes this blog very unique. Lucky – just curious what don’t you like about Doha. I couldn’t decide how I felt about when I had an overnight layover last year. I think I liked it overall. Oh man, those “bunk beds”. How strange to be in the window seat with a stranger in the aisle. Hop! That aside, the dinner meal looks pretty tasty! Woah. I wish all airline salads looked that good. I would have just combined both salads into one both. Actually, I probably would have asked the flight attendant for a couple additional salads. I can’t believe they serve that kind of food on a red-eye. It sure puts the U.S. airlines to shame for the crap they serve on an overnight flight to Europe, a red-eye from SFO to JFK, and a red-eye from HNL to SFO. And look at all that cheese. Can we say #cheeseplateporn? I suspect you couldn’t sleep because you ate all that food. You probably consumed an unneeded 1,500 calories, given you would have normally been sleeping during this period. 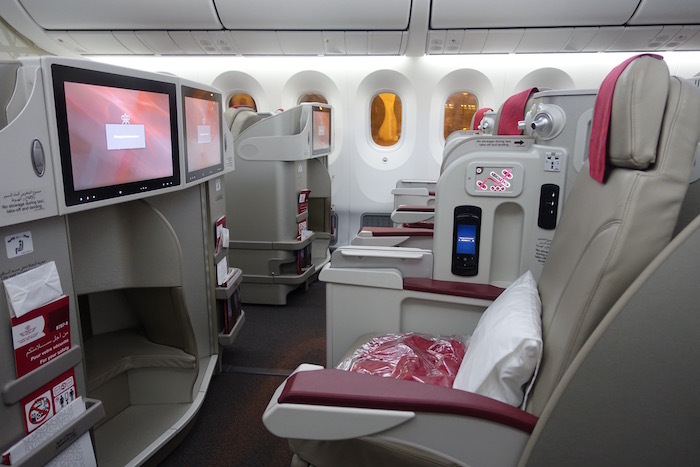 I enjoy your reviews, have only experienced business class on Air Canada flights to UK , Barbados , New York and Domestic. The Boeing 767 were 1 -2-1 , Airbus 319 , 320 were 2 -2 and AC Rouge was AB 319 3 – 3 with middle blocked off. , that was strange. Lol usually you complain when food is delivered on one tray and act like it’s a mark of bad service, but here you say, “all of breakfast was served on one tray, fortunately.” Makes a ton of sense! I plan on booking CMN-JFK route using my miles, I’d like to take advantage of the free stopover…is Europe my only option? While I hear you on the blanket, can you tell me more about the pillow? I realize this was over a year ago, but im interested to know about the pillow. Was it a feather pillow? Poly fill? Do you know about what size it was similar to?